While the great debate wages over the terms “expansion joints” vs. “control joints,” no one denies that they are both forms of “movement joints” and are necessary to prevent cracking in clay masonry veneer walls. Thus, it is important to understand the types of movement in clay-based masonry veneer walls and how to control the cumulative effects through the proper design of movement joints. It has been said, “either you or nature will decide where to locate masonry movement joints, either way they will occur.” And while architects tend to like straight, clean lines for building movement, nature is not so particular. Unplanned movement in masonry walls often results in broken masonry units, unsightly cracks, and water intrusion into the building. Movement occurs both vertically and horizontally and occurs at different rates in dissimilar materials. Good design of movement joints requires the aesthetic placement of joints in locations necessary to accommodate anticipated movement. In order to accommodate for the total unrestrained movement of brick veneer, movement joints must be designed into the wall. The placement of these joints generally takes into consideration both the art and science of building design and functional aspects. The designer must consider building geometry (height, length, offsets in walls), materials, fenestrations, and building structural system. Brick veneer walls may include both horizontal and vertical joints, joints at dissimilar materials, and joints around wall penetrations. The building code prescribes a maximum supported height for anchored veneer masonry without an engineered design. This is typically about 30 ft. above the foundation or every two floors. Brick veneer is generally supported on steel shelf angles and provision for movement is provided immediately below the shelf angle. This includes a minimum ¼‐in. compressible material and a sealant joint. Some owners and designers object to large horizontal movement joints; lip brick may be used to minimize the apparent size of the joint. The difference, while subtle, is important to understand when planning out any brick veneer wall. Building materials expand and contract based upon their design coefficient of thermal expansion. 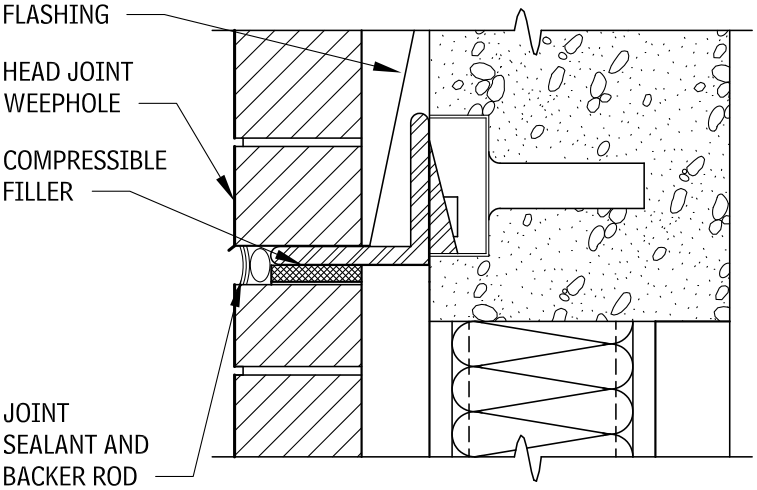 Differing materials are also subject to long‐term expansion or contraction due to moisture. Clay masonry absorbs moisture and expands while concrete masonry typically hydrates and shrinks. When dissimilar materials are used as part of the exterior cladding, and penetrations through walls of differing materials are subject to different rates of expansion, the wall design must accommodate this movement. Movement can occur at window openings, canopy attachments, precast concrete lintels, stone banding, and other similar areas. Brick and tile are classified according to the specific location where they are used. Standard specifications have been developed to produce uniform requirements for brick. ASTM International publishes the most widely accepted standards on brick. Standard specifications include strength, durability, and aesthetic requirements. Terms used in each standard for brick classification may include exposure, appearance, physical properties, efflorescence, dimensional tolerances, distortion, chipping, core, and frogs. Brick may be classified by use, grade (exposure), and type (appearance). Properties should be identified. Each ASTM standard has minimum requirements for grade and type, which will be used as the default property if another is not specified. 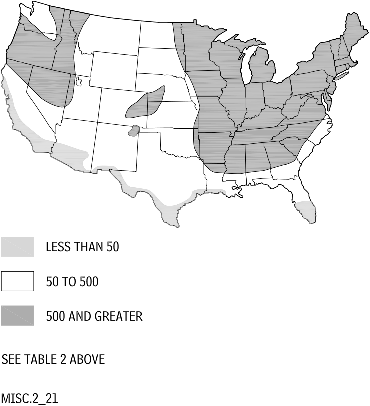 Specific grades of brick are required to accommodate the various climates in the United States and the different applications in which brick can be used. Brick grades include Severe Weathering (SW), Moderate Weathering (MW), and Negligible Weathering (NW); each is based on the weathering index and the exposure they will receive. The weathering index is the product of the average annual number of freezing cycle days and the average annual winter rainfall in inches (see Figure “U.S. WEATHERING INDEXES”). The exposure is related to whether the brick is used on a vertical or horizontal surface and whether the unit will be in contact with the earth (see Figure “EXPOSURE”). A higher weathering index or a more severe exposure will require face brick to meet the SW requirements. The grades for each specification are listed in Figure “GRADE REQUIREMENTS FOR FACE EXPOSURES”.